My, how time flies when you’ve overstayed your welcome! Our accidental heroes have spent their night in Cool Ranch, and that night became another night, and that night became a fortnight! There’s something strange in their neighborhood and it certainly doesn’t look good. The poor town is being terrorized by Chair’s love and Jamela’s lust. Cool Ranch’s can bear the torment no longer there is only one solution: Eviction! This project has been in the works for a long time now, longer than any compilation that I’m aware of, but it’s been well worth the wait. 20 tracks, each dedicated to a side of the icosahedron we all know and love, each one deserving to be there. Z. of Hipster, Please! has outdone himself with this compilation, summoning an incredible and eclectic group of musicians to entertain the listener with the multifaceted sides of gaming: be it something new like I Fight Dragons‘ Brian Mazzaferri’s Offering, something remixed like 8-Bit Weapon‘s take on MC Frontalot‘s Hassle the Dorkening, or something that even the non-gamer can relate to, like Orlando’s own Marc with a C‘s Don’t Know A Thing About Role-Playing. The entire compilation is free, so if you enjoyed the music on this month’s Dungeons & Doritos, it’s highly recommended to just head on over here and pick it up for yourself! 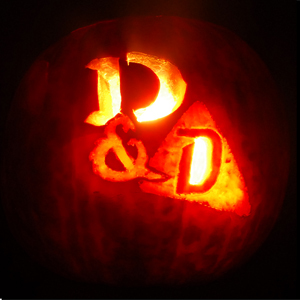 Another special thing about this month’s episode is the album art: a hand-carved jack-o-lantern courtesy of the outstanding Ms. Eleanor Edwards. Thanks Eleanor! It’s amazing! Click the pic above to make it bigger. 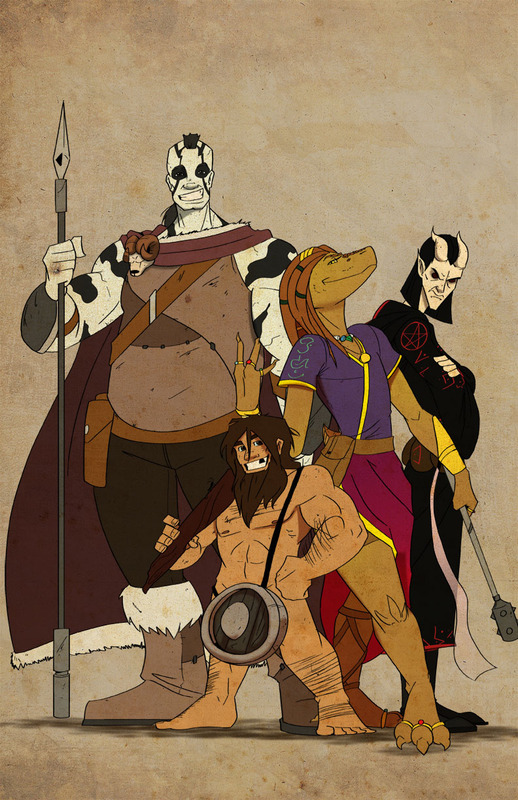 Want to see each of the character illustrations in all their glory? Head on over to the character bio page to check ’em out! Nerdy Show 239 :: Truly Outlandish!